With the Samsung Galaxy S5 slated to be unveiled on February 24 at the Samsung Unpacked 5 event in Barcelona, the flagship device has been spotted at the benchmarks revealing its specs. 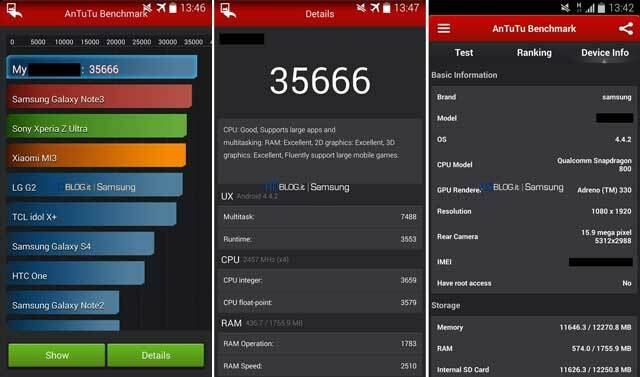 The alleged Samsung Galaxy S5 was put through the AnTuTu Benchmark test and scored a whopping 35666, which slightly higher than the Note 3. However, the specs listed on the app are highly undermining given the shiny rumours we’ve been hearing about. The listing claims that the device would have a 1080p resolution for the rumoured 5.2 inch display. The Benchmark also reveals that the Samsung Galaxy S5 is powered by the older Snapdragon 800 processor clocked at 2.5 GHz, not the Snapdragon 805. There is the standard 2 GB of RAM and 16 GB of internal storage. The camera is confirmed to be a 16 MP sensor with a 2.1 MP front facing camera. Surprisingly, the Benchmarks do not indicate anything about the heavily rumoured fingerprint scanner or iris sensor. If this benchmark result is to be believed, we are just proving Eldar Murtazins report to be true. He had clearly mentioned that the Galaxy S5 would launch sans the Quad HD display or the iris sensor.